Savory, hearty, crunchy and fresh, these Brussels sprouts will turn a sprout-hater into a sprout-lover! 1. Preheat oven to 400°F and line a baking sheet with parchment paper. 1. In a large bowl, whisk together balsamic vinegar, maple syrup, oil, salt and pepper. 1. Add the Brussels sprouts to the balsamic mixture and toss them until they are completely coated. 1. Pour the Brussels sprouts out on to the baking sheet in a single layer and place them on the middle rack of the oven. 1. Roast the Brussels sprouts for 30-35 minutes. 1. 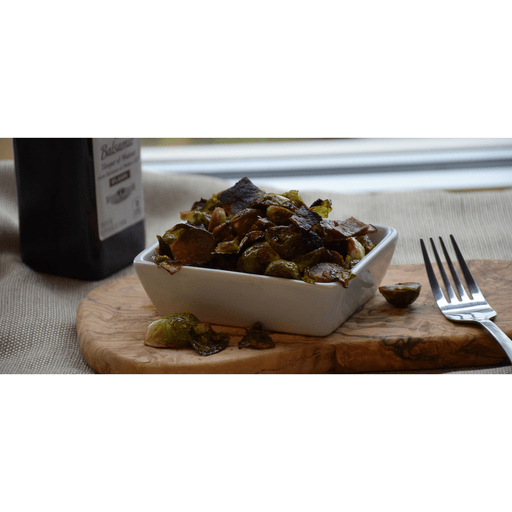 Pour the Brussels sprouts into a serving dish and toss together with the cooked and diced bacon. Calories 110, Total Fat 4.5g (Saturated 1g, Trans 0g), Cholesterol 15mg, Sodium 440mg, Total Carbohydrate 14g (Dietary Fiber 4g, Sugars 6g, Includes 1g Added Sugars), Protein 6g, Vitamin D 0%, Calcium 6%, Iron 10%, Potassium 10% *Nutritional values are an approximation. Actual nutritional values may vary due to preparation techniques, variations related to suppliers, regional and seasonal differences, or rounding.